There is a great debate in the knitting/crochet pattern designer community over selling finished objects made from patterns. Some designers even go so far as to try to put a “license” on their pattern to restrict the sale of finished objects made from the pattern or to charge more for a pattern that people intend to make for sale in a craft show or on Etsy. In one of my knitting classes right now we are knitting a top-down sweater that has a increase stitch every other row/round at the raglan lines separating the shoulders from the back and front. We start out the sweater by knitting flat; knitting one row, then purling one row. 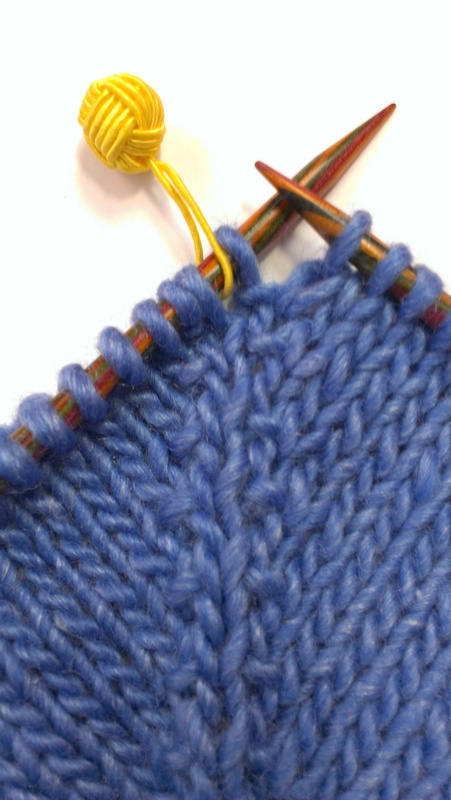 It’s easy to remember that you only increase on the knit rows, and not the purl rows. Since it is a pullover, after the V-neck shaping is finished, we join the flat piece of knitting into the round. The first round after joining replaces a purl row, so there are no increases. Then after that you make the increases on every other round. 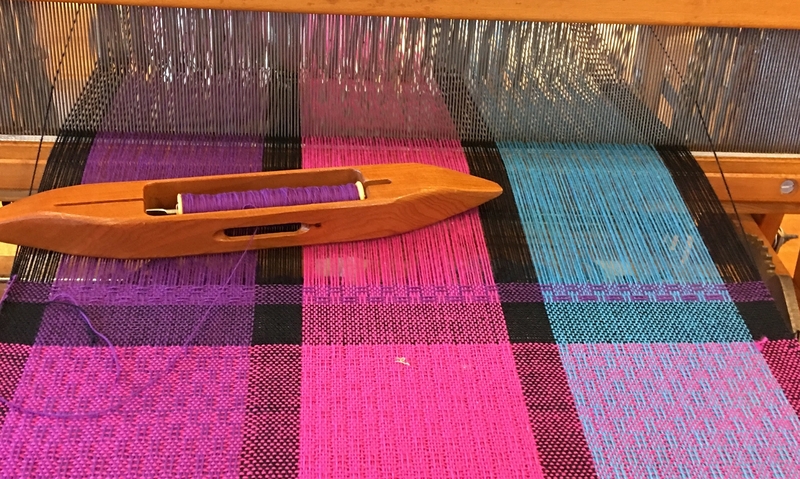 If you look at the fabric you are making, as you come to the marker that reminds you to make a KFB (knit front back–sometimes called a bar increase) you can see whether or not you should increase in the current round by noticing the little bump or bar that you created on a previous round. In the photo to the left (click on it to make it bigger), you can see I have reached the point in the round that I have “knit to within one stitch of marker”. This is where I have to decided to increase or not to increase. If I didn’t remember if I was knitting an increase round or not, I can tell by looking at the stitch I am about to knit at the marker. Look at the base of the stitch on the left-hand needle. You can see a little bump or bar at the base of the stitch. This means that stitch was the “back” of the “knit front and back” in the previous row, therefore I should just knit it this row, not increase in it. This next photograph on the right show the same point of the knitting one stitch before the marker. This time the bar is in the stitch BELOW the one that is on my left hand needle. The one I am about to knit on the left hand needle does not have a bar at the base, therefore was not an increase. When I knit that stitch before the marker, I should KFB to make an increase on it. 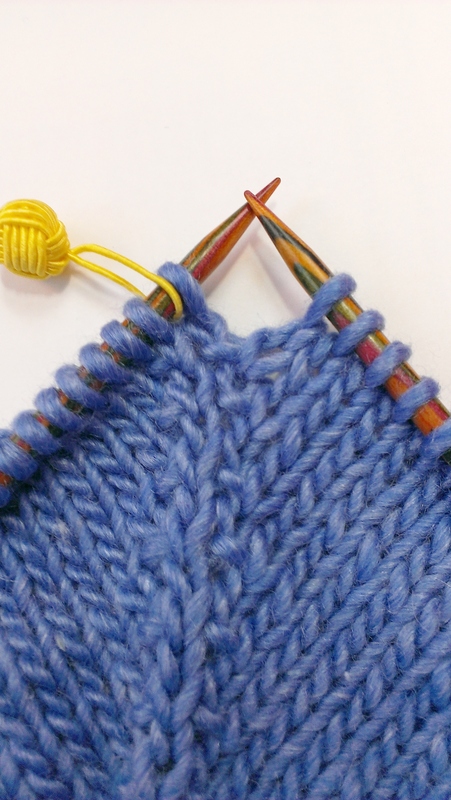 If you learn to “read” your knitting, it can help you to figure out where you are in the pattern and what you should be doing. This comes from really looking at it as you are working on it. Look at the fabric you created below the needles; when you see something that doesn’t look like plain knitting, try to relate that to the instructions you have followed to create it. Decreases, increases, yarn overs and slipped stitches are all obvious if you look at them after you make them and notice how they have changed the stitches.. I don’t have to keep track if I am on and increase round or not, I just look at the stitches when I get to the marker, and let the knitting tell me what to do. I will occasionally count my stitches so that I can be aware of how many stitches are in the back section of the sweater. The pattern says to stop increasing when the back reaches a certain number of stitches. This is my new hat pattern. It is knit from 100% bulky wool (superwash for easy care). The ribbing is a double thick hem for an extra chilly day, but it could be knit as a single thickness as well. It has four stitch patterns to give it interesting texture. Hence the name, Four-Way Chilly. 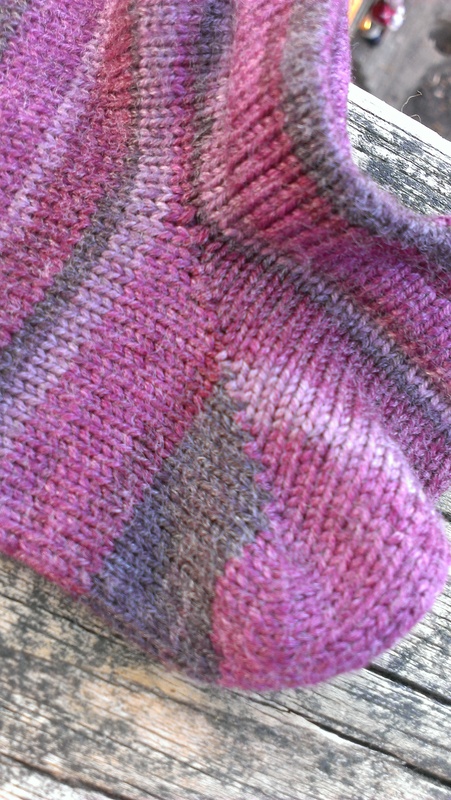 I am going to make up a worsted weight version as well and will likely be offering the pattern on Ravelry. Look for it as soon as I can write it up and have it test knit. It is finished! A great cowl from a great yarn.